How Sagoon, a social media platform helps you earn money by spending time online? Sagoon is a social e-commerce platform that helps them connect with like-minded people, share ideas and get cashback. Sagoon combines features of Facebook, Twitter, WhatsApp, Snapchat, and Instagram all together. While user can use Sagoon.com for sharing knowledge and information and at the same time user can earn money and gifts too. Inside the user account user can find one Smart Card as well as their personal and business page. Great thing is when new account registration/sign up, Sagoon.com user gets $5 just for being part of Sagoon. Members can earn more money later using different features of Sagoon. Why we chose Sagoon as Startup of the Week? The Sagoon Social Smart Card is a one digital card solution uniquely designed for users and customized to enhance their online shopping, buying and gifting experience. The unique approach of this company allows any user to connect with other like-minded people and earn reward points. Sagoon offers features like My Day to create and share schedules and to-do-lists, and set reminders; Secret Sharing tool to secretly share a learning, finding, experience or a thought and Mood Talk emoticons, stickers for a group or private chat. Great thing is when new account registration/sign up, Sagoon.com user gets $5 just for being part of Sagoon. Social media platform Facebook has around 25000 fan following. Govinda Giri, founder of Sagoon was working as a system engineer in Pentagon, USA. He once attempted to develop a search engine to compete with Google but the idea and effort was not materialized and he failed. But with double effort he recovered back and again bounced back in the run. He launched Sagoon to solve the problem of digging others information in social media which often leads to depression like her wife faced. Initially he invested $40K to start Sagoon which has grown to $540K so far. Sagoon started as a search engine in 2009 later evolved into a social network by 2014. The portal started its operation from November 2015 and currently has a registered user base of 2.5 lakhs. Currently a team of 30 members, the startup already has 2.5 lakh members and majority in the age group between 25 and 34. It has one million users in the waiting list. The company uses online and offline marketing and has registered users from India, Nepal and the US. The company has a strong user base in Kathmandu, and now the focus is Delhi. The company also plans a mini-IPO. My Day: The fastest way to create & share schedules and to-do- lists, and set reminders. It has been designed to simplify your daily professional and personal lives, and improve productivity. Secret Sharing: A tool to share secret publicly or anonymously. A secret is learning, finding, experience or a thought that you think can help and benefit the society. Or, it could be any information that you want to publish without disclosing your name. Mood Talk: A great way to let your moods do the talking. Use custom emoticons and crazy stickers during a private or group chat, and make it even livelier. 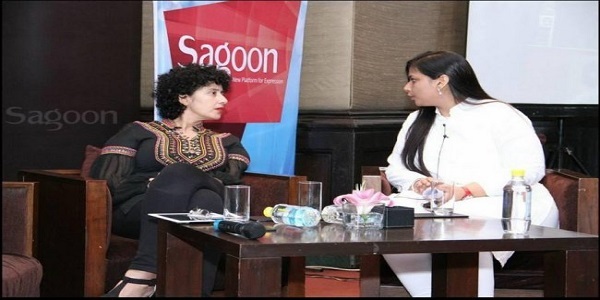 Indian social media startup Sagoon plans to raise $1.8 million by giving about 10% stake in the company. The amount of capital raised will be used to expand the platforms user base, enhance product infrastructure and develop and launch a mobile app.